Colombia's Congress Ratifies Second Peace Deal With Marxist Rebels : The Two-Way A peace agreement with the leftist rebel group FARC was narrowly rejected in a national referendum in October. This new deal was renegotiated and submitted to Colombia's Congress, bypassing voters. The Colombian Congress endorsed the new peace agreement signed between the government and the Marxist rebel group known as the FARC. Two months after Colombian voters narrowly rejected a peace deal with the Marxist rebel group FARC, the nation's Congress has ratified a renegotiated agreement. If implemented, it will bring to an end a more than half-century guerrilla war that has killed more than 200,000 people and displaced an estimated 8 million. Colombia's Congress approved a modified peace treaty on Wednesday night by a 130 to 0 margin. Although tougher on the rebels than the original accord, opposition lawmakers staged a walk-out to protest provisions that will allow guerrillas accused of war crimes to avoid prison. The 6,000-strong rebel group known as the FARC will now start gathering in special zones around the country, where they will have 150 days to turn in their weapons to U.N. inspectors. Colombian President Juan Manuel Santos and top rebel leader Rodrigo Londoño, known as Timochenko, signed the first peace accord to great fanfare in September in the resort city of Cartagena. The accord was submitted to voters in a national referendum and rejected by a slim margin. Opponents argued the agreement did not hold to account FARC — an acronym for the Spanish name of the group, Revolutionary Armed Forces of Colombia — for its decades of terrorism, drug trafficking and plunder. Days after the agreement's stunning rejection by Colombia's voters, Santos was awarded the Nobel Peace Prize for his efforts to end the war. Santos renegotiated the agreement and bypassed voters by submitting it to Congress for approval. 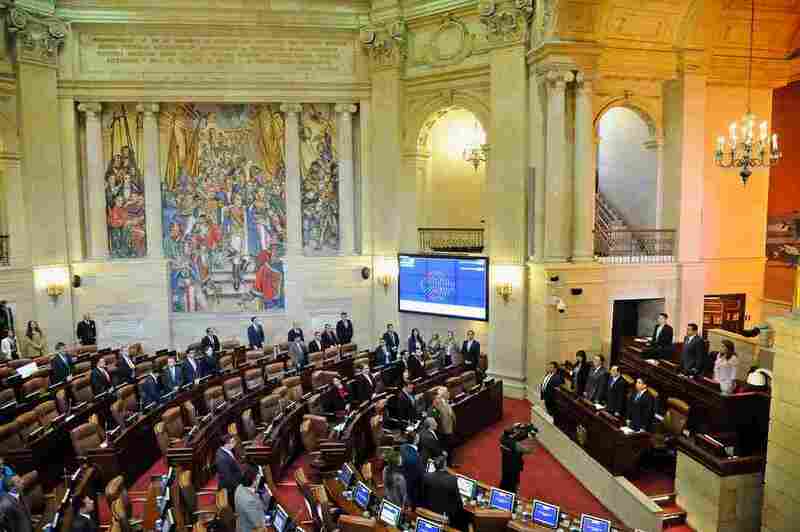 The Colombian Congress is expected to pass an amnesty bill that will allow rank-and-file guerrillas to return to civilian life. Rebel commanders accused of war crimes will go before special tribunals and could be sentenced to up to eight years of community service. The FARC's long-term goal is to form a left-wing political party and to take part in elections starting in 2018.